This means on orders over $100, there is no extra cost per shirt for embroidering your logo, up to 7,500 stitches. Larger logos or multiple embroidery areas may incur a small added cost per shirt – but 7,500 stitches for free will cover 90% of all requests. This applies for standard UPS ground shipping to one address. UPS shipping will allow you to track your shipment and receive a signature verification of delivery. Shipping to multiple addresses, or requesting overnight, 2-Day or other rush shipping will be charged at our discounted shipping rates without additional mark-up or handling charges. On your first order, setting up your embroidery requires us to digitize your logo, which is normally a onetime $30 flat cost per logo. We waive this cost on all orders over $300, so you get your embroidery set up for free. Once we have your logo digitized, you can do exact repeat orders of the same logo at no extra charge! 5% OFF TAKE 5% OFF all orders over $400! We will automatically deduct 5% of the total cost of your order at checkout. 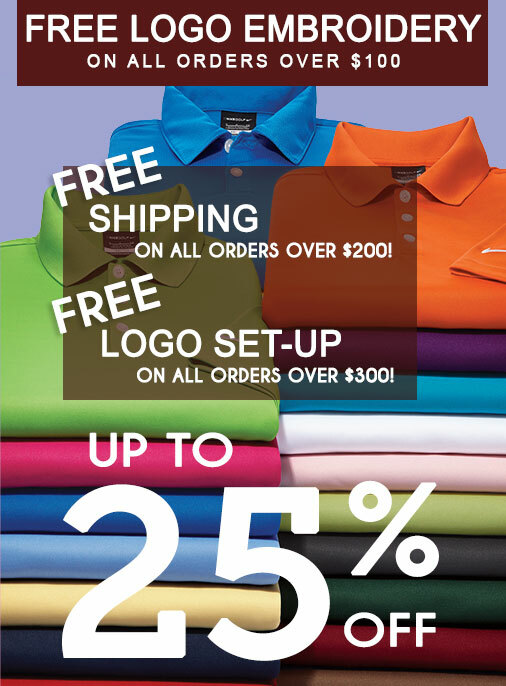 You also get Free Embroidery, and Free Shipping and Free Logo Set-up… you SAVE BIG when you place bigger orders! 10% OFF TAKE 10% OFF all orders over $500! We will automatically deduct 10% of the total cost of your order at checkout. 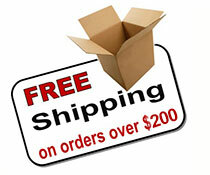 You also get Free Embroidery, and Free Shipping and Free Logo Set-up… you SAVE VERY BIG when you place bigger orders! 15% OFF TAKE 15% OFF all orders over $750! We will automatically deduct 15% of the total cost of your order at checkout. You also get Free Embroidery, and Free Shipping and Free Logo Set-up… you SAVE VERY SUPER BIG when you place bigger orders! 20% OFF TAKE 20% OFF all orders over $1,000! We will automatically deduct 20% of the total cost of your order at checkout. You also get Free Embroidery, and Free Shipping and Free Logo Set-up… you SAVE VERY EXTRA SUPER BIG when you place bigger orders! 25% OFF TAKE 25% OFF all orders over $2,000! We will automatically deduct 25% of the total cost of your order at checkout. You also get Free Embroidery, and Free Shipping and Free Logo Set-up… you SAVE VERY EXTRA SUPER HUGE MONSTER BIG when you place bigger orders! Big Savings – No Gimmicks! See, it’s all very easy and straightforward – NO TRICKS! But if you have questions, please give us a call or send us a quick email… we’re here to make this as easy for you as possible!